The Verrazano-Narrows Bridge opened in 1964 and at the time was the worlds largest suspension bridge. It towers 693 feet tall and spans 13,700 feet! This bridge is so long that engineers had to factor in the curvature of the earth when it was built. The bridge, located in New York City, connects the borough of Brooklyn to Staten Island and is largely credited with the population explosion of Staten Island after it’s completion. 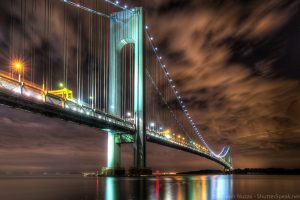 Although the bridge is named after Giovanni da Verrazzano, the first explorer to sail this section of New York harbor, the name of the Verrazano-Narrows bridge is spelled incorrectly. The correct spelling is “Verrazzano” (with 2 z’s). Although there have been several petitions to correct the spelling of the bridges namesake explorer, the Metropolitan Transportation Authority states it is simply too costly to correct. This photo is available for purchase in my online New York City Gallery. The Verrazano-Narrows Bridge. Click on the image to see it larger. Copyright © 2013-2019 Shutter Speak, LLC. No reproduction of any kind without written permission.